This is about what you'd expect from a kids' book -- the promotional material targets ages 3-7 -- featuring the great Mark Newgarden. Bow-Wow Bugs a Bug is essentially a long-form, pictures-only comic, albeit one with the kind of splash pages one may be more used to seeing in a kids book. A dog is distracted enough by a bug to follow him out into the street, where he begins a series of surreal encounters. 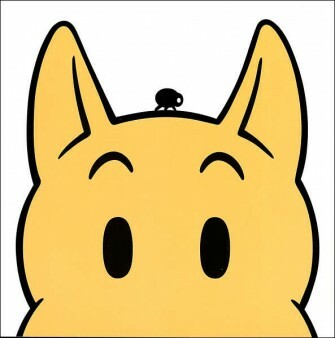 There are two great set pieces where the dog barks all the spots off of fellow dog because they look like the bug, and one where he encounters an army of bugs chasing after tiny little bugs. It has the series of escalating variations and freaky non-logic of most kids' books I liked at that age, and the satisfying, warm ending that kids like me used to demand. If you're a Newgarden completist, you'll likely want one, too. I wish there was more to say, but it's not that kind of a book.